Cwtsh is the Welsh word for a hug, not just any type of hug however, a rather special one, blessed with the war mth and generosity of the Welsh, a truly free flowing expression of love and acceptance. You know that lovely warm feeling you get when someone special puts their arms around you, sheltering you from the world and its pressures just for a moment? It’s that! That’s a cwtsh! What a feeling. If you’re Welsh, then you already know about the special gift of a cwtsh, if you’re not, then become an honorary Welsh man or woman and pass the cwtsh onto someone else as soon as you can. You never know what a difference a cwtsh can make! 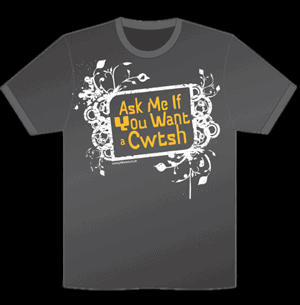 Merchandise: Contact Phil for a Cwtsh T-shirt – Cwtsh Mugs & Cwtsh Cards. The unique and perfect gift for that special person in your life.